I have no real excuse for posting this, but it is the result of an experiment and all experimental results should be published, right? Last night I went out to a semi-dark area for one final practice session with my tracking mount before I head off to northern California. I decided to see how well the tracker works with the lens at full zoom, and this is the result. 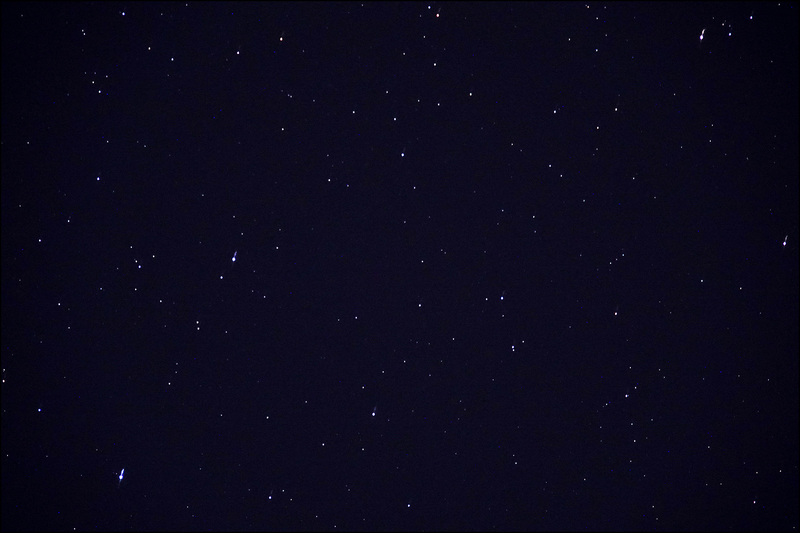 The lens is zoomed out to 220 mm (600 mm equivalent) and the exposure time is about a minute. I have no idea what part of the sky this is. I just pointed the camera upward and took pictures at a few different spots. Anyway, the tracking is not bad! There’s very little apparent motion even at full zoom. However, one minute is as far as it can go. I tried a frame at two minutes and it was clearly streaky. This picture has an exposure time of 9 seconds and there are no plumes. The arrow points to the star at the very bottom of the upper picture, which has a noticeable plume there. Any ideas what this is? UDPATE: A reader suggests the plumes are vibrations from bumping the camera at the beginning or end of the exposure. That’s entirely plausible given my general ham-handedness around delicate equipment.